If you are fortunate, you are lucky. If you have a fortune, you are wealthy in the material sense or you're reading a magazine that you hope will get you there. If you find yourself in Fortune, you could be in Arkansas, California, Newfoundland or the Philippines. Or you could be a soldier of Fortune, an adventurer with your own magazine, (with what seems like a lot of weapons involved). Did you know that the boat on a second trip to deliver more Pilgrims to the Plymouth Colony in 1621 was called "Fortune?" Neither did I (and it's history is not very fortunate). Perhaps you just opened your Chinese cookie. Now we're getting somewhere. Next week and for a couple more weeks is the celebration of the Chinese New Year. The Chinese calendar follows the lunar cycles, so it's a movable holiday (this year starting January 27 or 28 depending on where on the planet you live) and involves a lot of noise-making and fireworks. 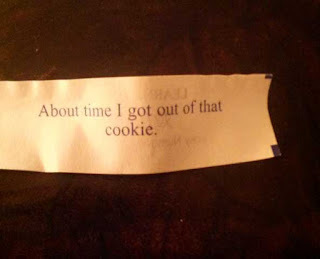 And with any luck, fortune cookies! Have some fun with your art and show us your "fortune" twinchies! Send them to 1xeritas@gmail.com by 2PM Tuesday, January 23, 2017 and we'll post them later the same day. Share with us any insight into the inspiration and blog links. And share the fun!